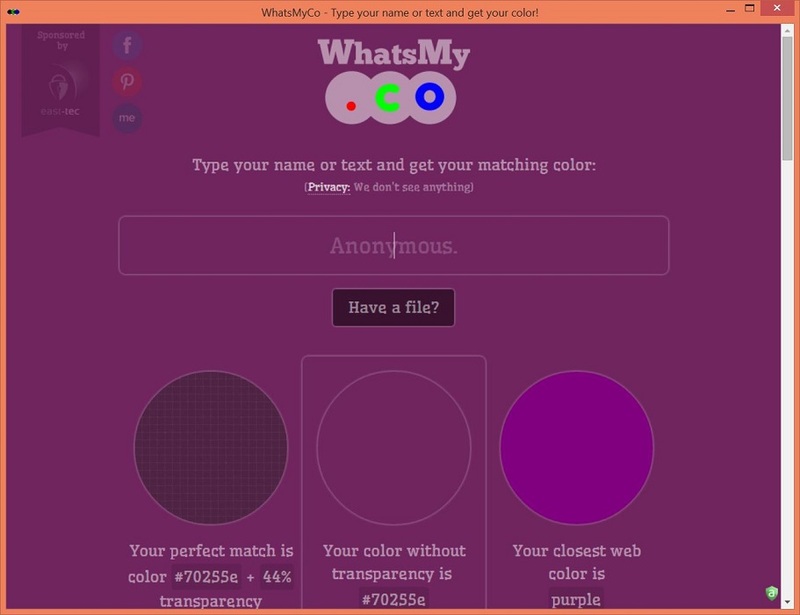 "Find out what color your name is!" Do you sometimes think about the colors that different things might be? The colors of people’s names? Quotes? Birthdates? Significant events? Neither did I until recently. 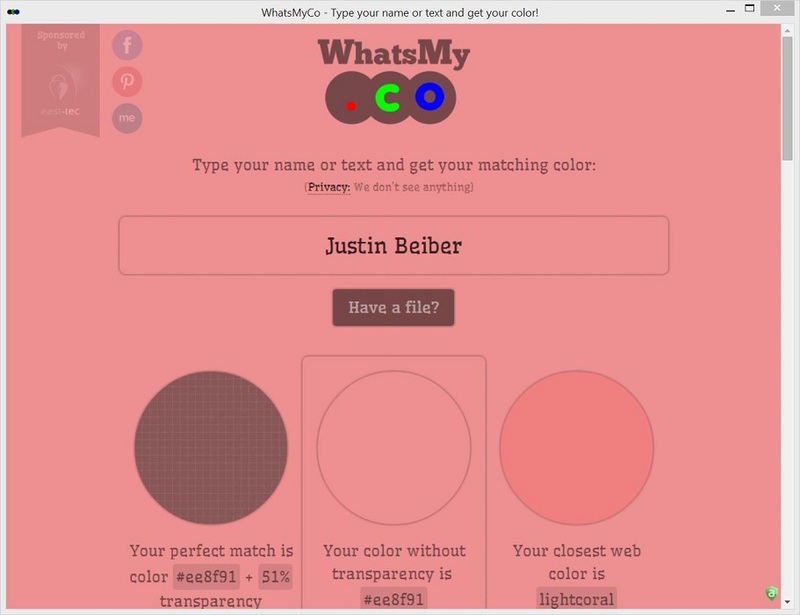 WhatsMyCo is another innovative idea from Aurelify that has to do with color. I tell you, they really love color at Aurelify. Check out some of their other colorful applications here in Colorviel and Colortypist. Each application serves a unique purpose and WhatsMyCo is no different. However WhatsMyCo is the only of the three mentioned that will run completely independent of an application. This is because it runs directly in your favorite web browser. WhatsMyCo computes the CRC-32 of any text that you type. And it is all done instantly, on the fly. So when you type, not only will you see the color of the word, name, or phrase that you’re typing, but you will also see the colors of the elements that make up the final result. The site is instantly converting a 32 bit number into rgba code with transparency for complete accuracy. CRCs (cyclic redundancy checks) are commonly used in digital networks and storage devices. They are both popular and famous for detecting accidental changes to data. If you check the same text more than once, you will get the same CRC every time. If you check two different pieces of text, you will get two different CRCs. Because of this efficiency and consistency Aurelify has been able to incorporate this into a colors system and essentially give each CRC a color, thus giving every letter, every word, every name, and every phrase a color. But what about security? There is, however, one way in which your data can be obtained, but it is all in your power and fault if this method is used. Of course we like to share things with our friends on social networks, but if you share any of the content from WhatsMyCo on Facebook or any other site that utilizes server side code, they will have your information. By downloading this application, you are installing a chrome app shortcut. The site will run like a chrome app on your Windows PC which offers you a better and more minimalist experience than what you would get from simply visiting the site. However, if you do not wish to download the Google Chrome shortcut app, you can always visit the web apps official website from any computer or smart device.